Our Abpromise guarantee covers the use of ab201740 in the following tested applications. 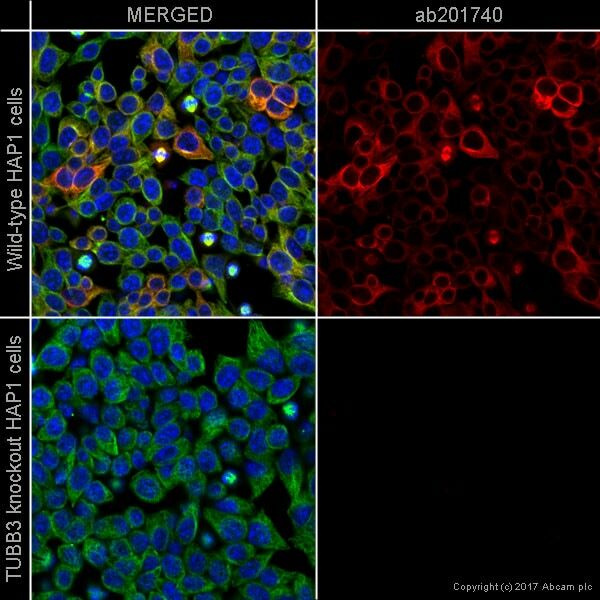 ab201740 staining beta III Tubulin in wild-type HAP1 cells (top panel) and TUBB3 knockout HAP1 cells (bottom panel). The cells were fixed with 100% methanol (5min), permeabilized with 0.1% Triton X-100 for 5 minutes and then blocked with 1% BSA/10% normal goat serum/0.3M glycine in 0.1% PBS-Tween for 1h. The cells were then incubated with ab201740 at 1/500 dilution (shown in red) and ab195887at 1/250 dilution (shown in green) overnight at +4°C. Nuclear DNA was labelled in blue with DAPI. 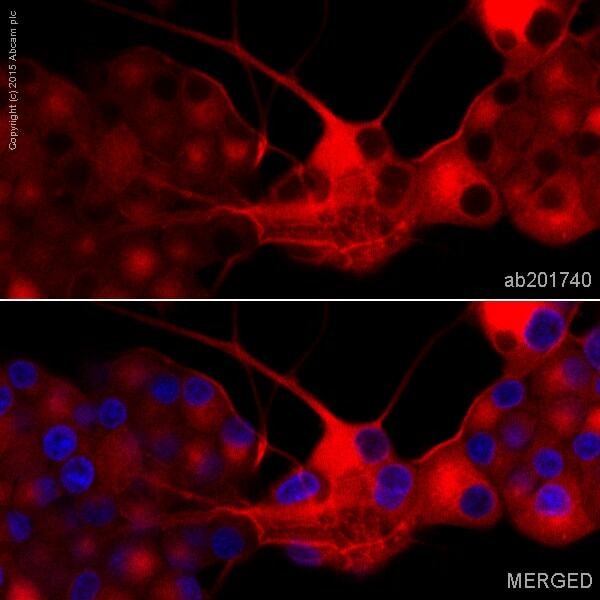 ab201740 staining beta III Tubulin in PC12 cells treated with NGF. The cells were fixed with 4% formaldehyde (10 min), permeabilized with 0.1% Triton X-100 for 5 minutes and then blocked with 1% BSA/10% normal goat serum/0.3M glycine in 0.1% PBS-Tween for 1h. The cells were then incubated overnight at +4°C with ab201740 at 1/100 dilution (shown in red). Nuclear DNA was labelled with DAPI (shown in blue). This product also gave a positive signal under the same testing conditions in PC12 cells fixed with 100% methanol (5 min). Publishing research using ab201740? Please let us know so that we can cite the reference in this datasheet. There are currently no Customer reviews or Questions for ab201740.